Home Basic Date Questions Conversion Problems How to convert ZonedDateTime to Date in Java? Write a program in Java that converts ZonedDateTime to Date. Date class is present in java.util. * package and ZonedDateTime class is present in java.time. * package that is part of Java 8 API. This conversion is very useful for large projects because it is a very basic problem that you should be aware. Note : Java 8 is required to run below code because ZonedDateTime class is in Java 8 API. * @problem how to convert ZonedDateTime to Date? // Get current date and time. // Convert Instant to Date. 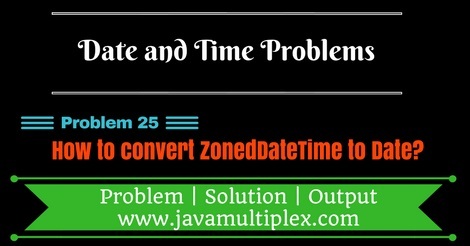 Output - How to convert ZonedDateTime to Date in Java? Tags : Date and Time problems, Conversion problems, ZonedDateTime to Date in Java, Solution in Java, Instant, ZoneId, LocalDateTime.